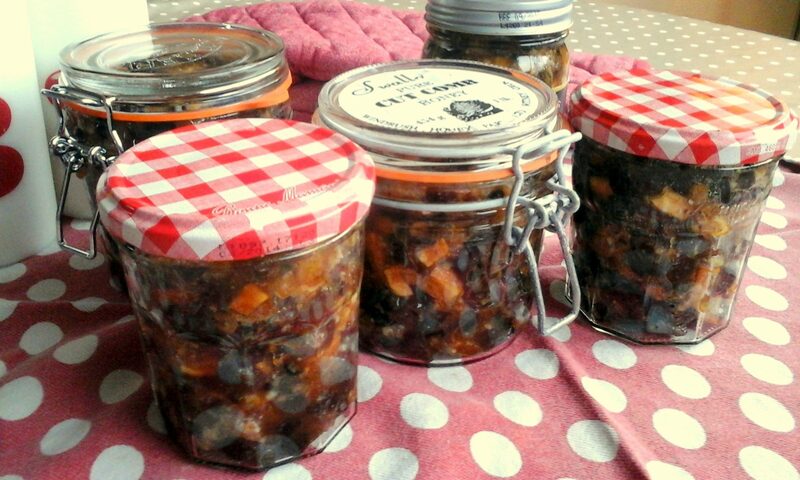 So after my gruelling 2012 Lorraine Pascale challenge, I decided I needed a break for a while. So I took 4 days off, and here I am, back with another Lorraine cake.This time it’s from her show “Fast, Fresh & Easy food” or whatever it was called. I took scribbled notes, and she didn’t give any measurements, so this is my approximation. 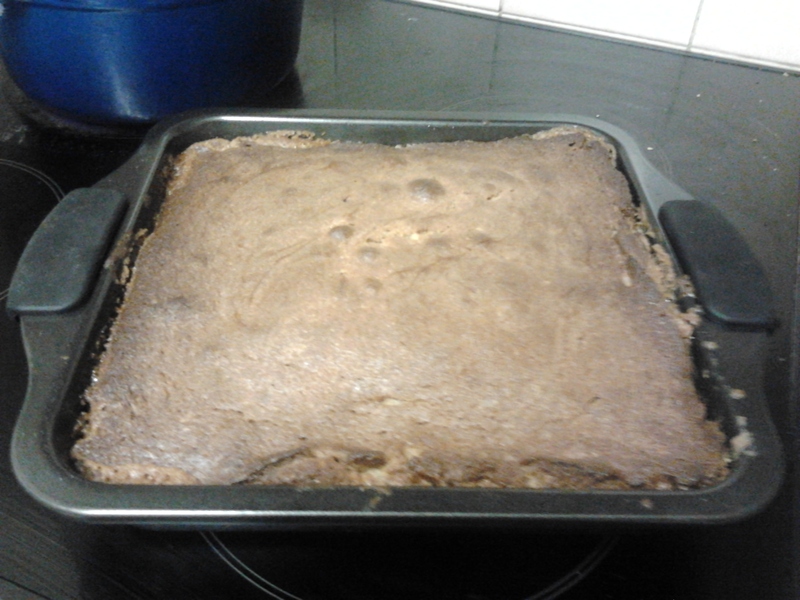 Start off by greasing and lining a square baking tin. 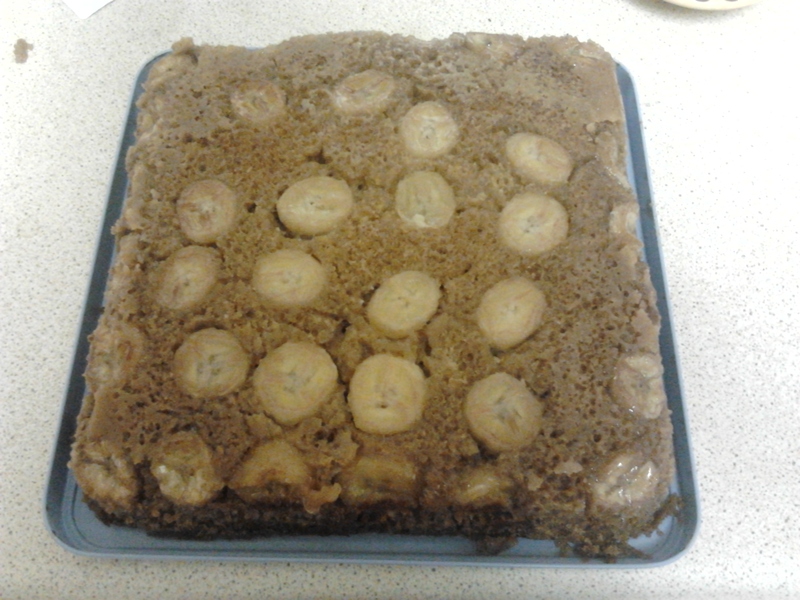 I ran out of greaseproof paper in the Christmas baking frenzy but my tin is non-stick anyway. 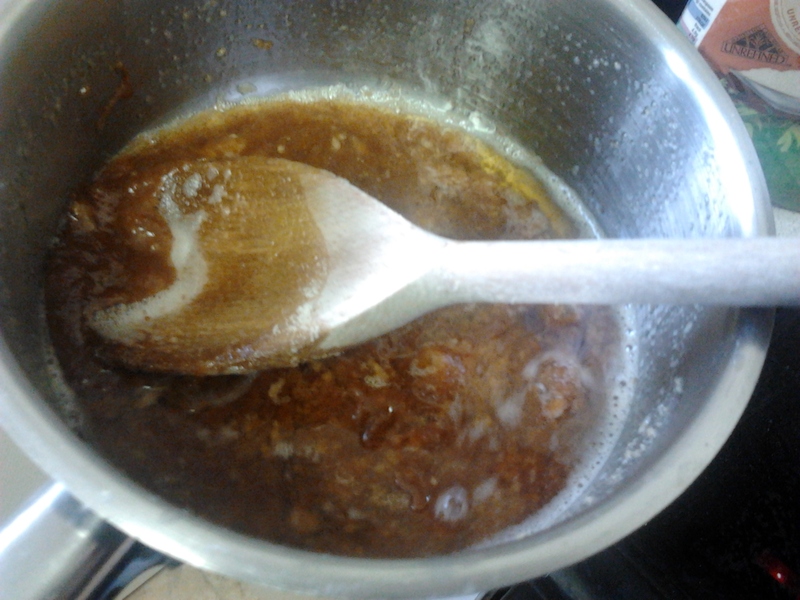 Then make a caramel sauce by melting 100g of butter over a high heat, add 100g soft brown sugar and stir until dissolved and syrupy. The first time I did it, I burned it. The next time I ended up with something more like fudge. Maybe it was too hot. 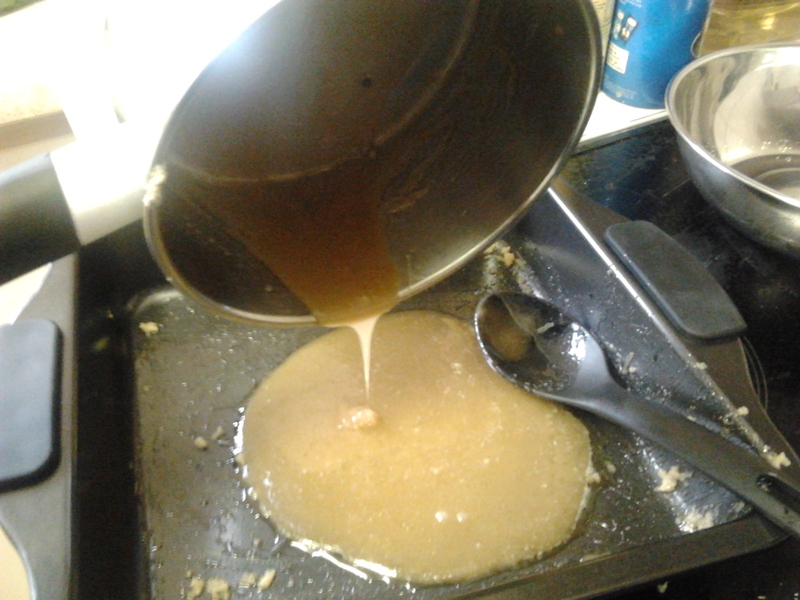 The next time, I got it nice and syrupy. Pour it into the tin. Now make the sponge by creaming together 8oz softened butter and 8oz soft light brown sugar. Beat in 4 eggs. 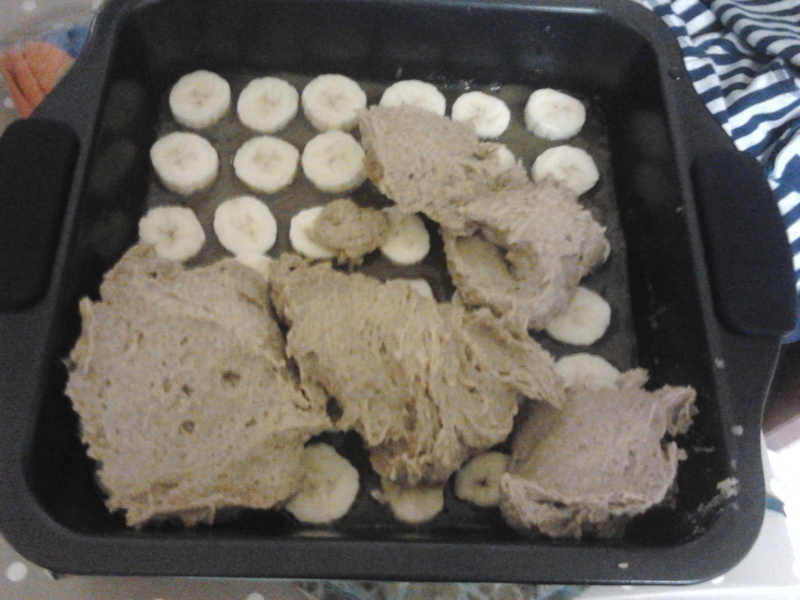 Then add 4oz wholemeal flour, 1tsp vanilla extract and 4oz self-raising flour. If you don’t have any wholemeal, use 8oz self-raising instead and omit the baking powder in the next step (you’ll end up with a slightly lighter sponge). 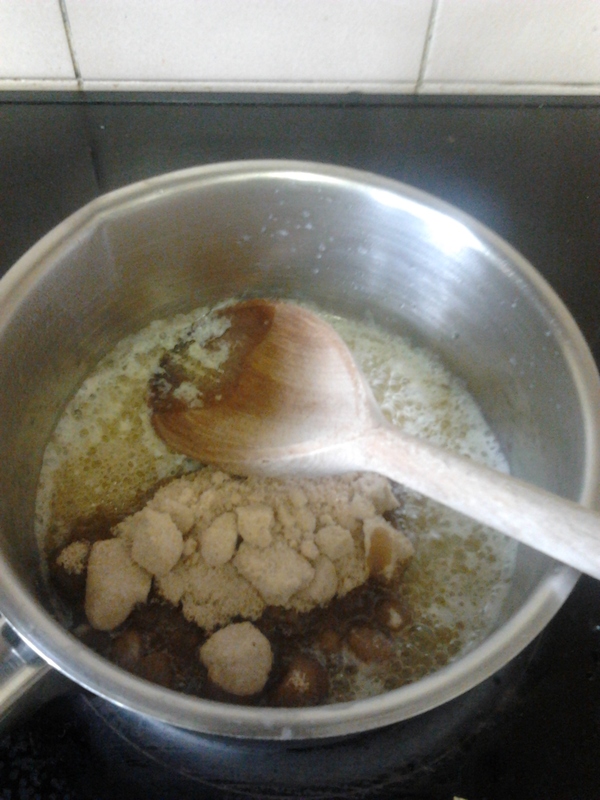 Then add 1tsp baking powder, 1tsp ground ginger, 1tsp cinnamon, a pinch of salt and a spoonful of treacle. 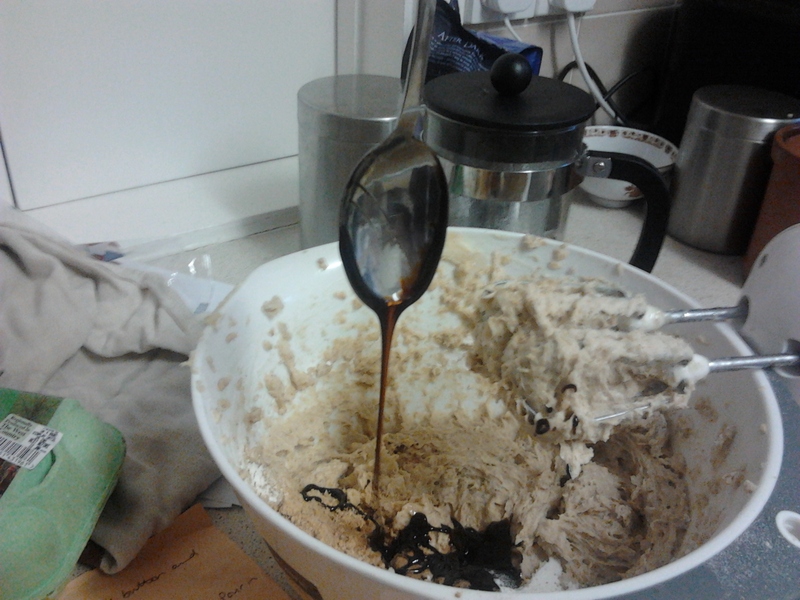 Top tip: oil the spoon first before spooning out the treacle and it will just drip cleanly off the spoon. 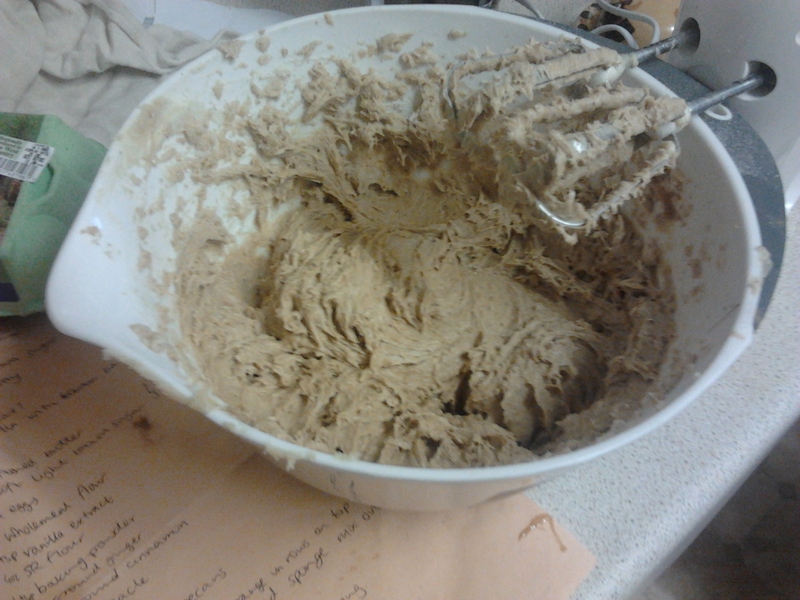 You end up with a sort of toffee brown sponge mix which tastes delicious raw! 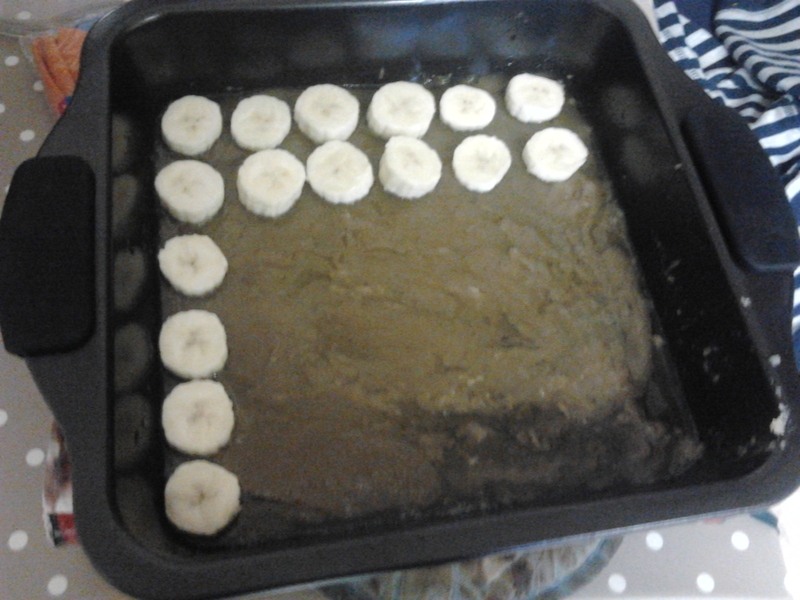 Now slice two bananas and arrange in rows on top of the caramel. Drizzle over a bit of Calvados. Spread the sponge mix over. 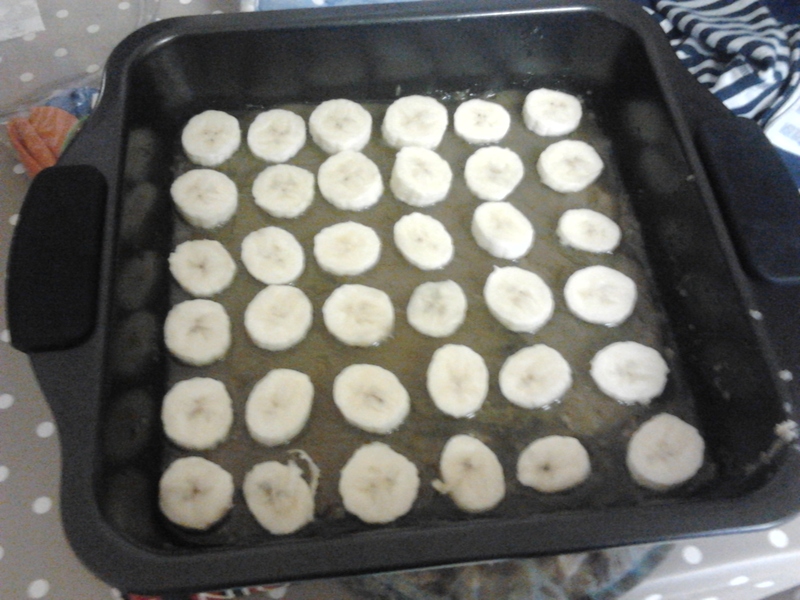 Ideally you don’t want to disturb the bananas so dollop it on, and then spread very gently. Some movement is inevitable I think! Bake for about 45 mins at 180’C. Leave to cool for 10 minutes before inverting onto serving plate (put plate, or tin lid in my case, upside down over the cake, hold them tightly together and turn it all over, then remove the baking tin). 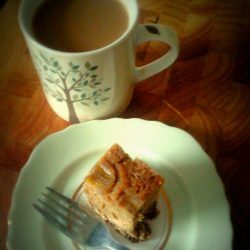 Serve in quite small squares because it’s quite filling! 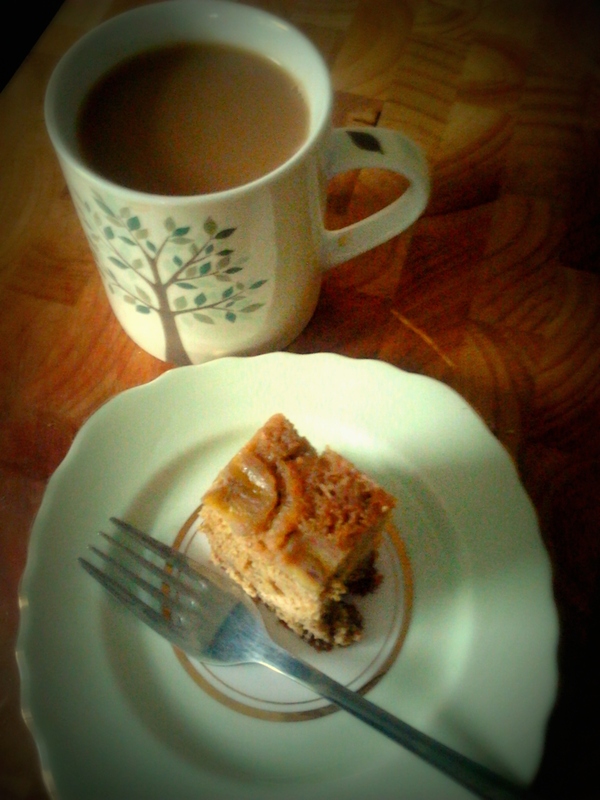 I called it a banoffee sponge, because people understand that, unlike “Dulce & banana cake.” Enjoy with a cup of tea! Looks great! Did you have calvados in the cupboard too? Your drinks cabinet sounds impressive! The Calvados was from our France holiday last year, but yes, I stock a bewildering array of spirits!